Get beyond corporate medicine to natural healing. 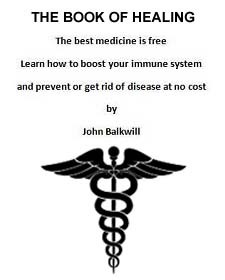 The best medicine in the world is in John Balkwill’s The Book of Healing in a concise, easy to read, 27-page .pdf format. Help Intrepid Report to continue bringing you the stories you need to make informed decisions with a donation of $10 or more. Help yourself by receiving a free copy of The Book of Healing and learn how to boost your immune system and prevent or get rid of disease at no cost. If you don’t have Adobe Acrobat, you can install the free Adobe Acrobat Reader here.